Your little one loves Christmas. The excitement starts as soon as it gets cold out. By the time Thanksgiving rolls around she can hardly sleep at night, forget visions of sugar plums dancing in her head, she's got all of Santa's workshop bustling around in there. When you showed her the Advent calendar not even the chocolates inside each little window could stem her disappointment when she realized that she would have to wait so long before Christmas day. We’re not going to be the ones to tell you that your daughter needs to chill. In fact, in a world like ours, we embrace all the enthusiasm we can get. So, if your daughter is ramping up for the holiday season before Halloween décor has even left the department store aisles maybe you should just toss your hands up and lean into the festive ride. This could mean making those Christmas cookies a little earlier, you can always pass them out to neighbors. Have her try a little rum free egg nog and memorize the words to classic holiday songs. This year when Christmas finally rolls around she'll be your family's Christmas expert. 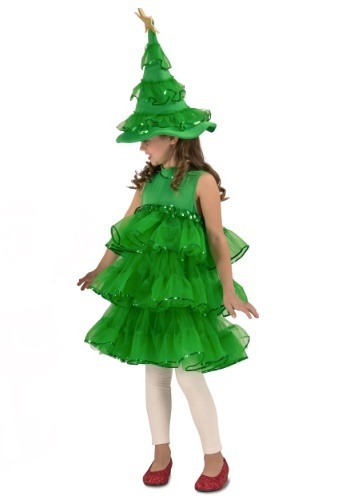 As she's making Grandma sentimentally cry as she sings "Away in the Manger" have her wear this Christmas tree dress and hat. Photos of this holiday will be treasured forever. This dress has tiers of rich, sparkly green tulle and a matching tiered pointed cap. It's topped with a star so you'll be able to see her sneaking behind the kitchen counters for one last gingerbread man. She's going to have a long awaited merry Christmas and with her enthusiasm, you're sure to have a happy New Year!